The revolution in MCU development. Each RENESAS Synergy™ MCU comes with the Synergy Software Package (SSP). And the verified programme packages. This makes it extremely easy to implement devices and sensors for the Internet of Things. It has hardly reached the market - and there is already red support for RENESAS Synergy™. Control big WVGA displays with capacitive touch function. With the Arduino-compatible EVBEVEFT813 GLYN board. We can show you a RENESAS Synergy™ S7 starter kit with a plug-mounted GLYN FTDI-EVE2 Arduino-compatible board as an application example. This board can be used to control large displays, e.g. WVGA with only one additional chip (FTDI-EVE2) using SPI or QSPI. An additional external memory is not required. Easily connect a capacitative or resistive touch unit. The display connection fits all displays in our range EDT TFT family concept from 3.5“ bis 7“. There is also an additional LVDS socket. The RTOS ThreadX® as well as various HAL drivers were installed here. The SSP is now extended by a its own programme package. 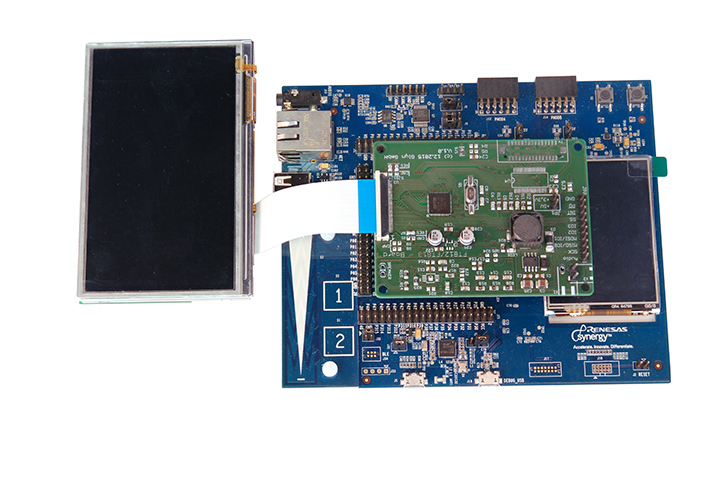 You can now order the Arduino-compatible GLYN board (Item No. EVBEVEFT813) for just €49.00*. The RENESAS Synergy Starter Kit SK-S7G2 (Item No. YSSKS7G2E30) is available for 82.00 €*.